One of Colombia’s first “peace babies,” children who are born and raised at reintegration site for demobilized FARC guerrillas, died at only seven months old after gunmen attacked his parents on Sunday. The death of the 7-month-old Samuel Gonzalez, the child of a demobilized FARC guerrilla and his girlfriend, devastated the demobilized FARC guerrillas who lived with the family and who witnessed to the baby’s birth and short life. The baby was born and living in the Simon Trinidad reintegration camp in Cesar where his father, the 23-year-old Carlos Enrique Gonzalez, was living with his family after abandoning the FARC’s 41st Front. The two parents survived the attack, but their baby died of his injuries on the way to the hospital. Instead of fighting in the country’s armed conflict as “Gustavo,” Gonzales dedicated his time to the Diana, the girl he met after his demobilization and with who he raising the baby they had in September last year. The couple was attacked while on their way to the baby’s grandmother. At the time of publication there was no clear perpetrator, motive, or explanation of the attack that injured both parents and killed the child. Samuel David was considered a “son of peace” – one of the babies born from former combatants after the 2016 signing of a peace deal between the FARC and former President Juan Manuel Santos. Particularly among demobilized guerrillas, these babies are treasured; having children was all but banned when the FARC was still in arms. 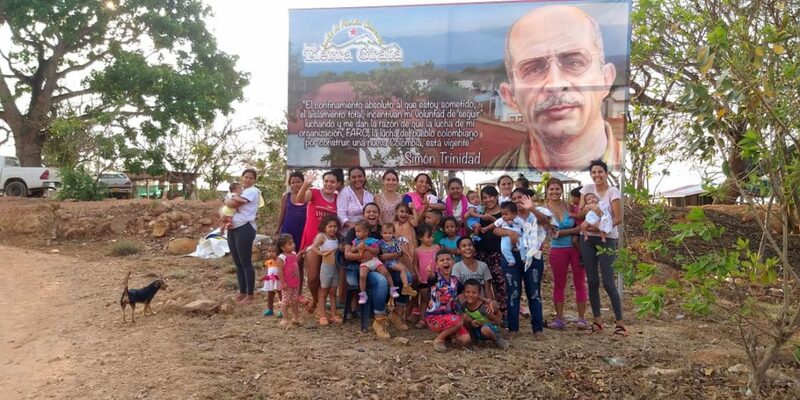 The attack on the FARC member and his family signals a wider threat to reintegrating FARC guerrillas and the peace process and was received with shock on social media. Many took to Twitter to share mourning under hashtag “#SamuelDavidHurts,” expressing concern about the ongoing killing of demobilized FARC members and social leaders. The FARC leadership urged the Prosecutor General’s Office to increase efforts to prevent and investigate violence targeting former guerrillas. We are deeply concerned because systematic killings continue. […] We are going to demand an urgent investigation by the Prosecutor General’s Office, but, above all, demand guarantees for our political participation and reincorporation, as agreed in the Havana peace agreement. Some 2,935 ex-combatants of the 9,000 guerrillas who demobilized in 2017 are still in FARC reintegration camp — many of them with newly formed families — where they try to find a way back into civilian life through labor projects and education. According to the latest UN peace monitoring report, at least demobilized 102 FARC members have been assassinated. The Prosecutor General last week said that 125 former combatants have become victims of violence.